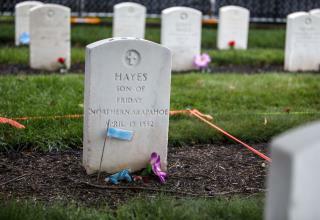 (Newser) – The headstone designated the resting place of Hayes Vanderbilt Friday—a name given to a Northern Arapaho child in what the Philadelphia Inquirer calls a "brutal, turn-of-the-century experiment in forced assimilation." The government-run Carlisle Indian Industrial School was established in 1879 as a place to scrub Native American children of their "savage nature," a process that involved forcing new names, clothing, and language onto them. More than 180 are buried in a graveyard there, and the Northern Arapaho are now reclaiming the three children that are theirs. This week, more than a dozen tribe members arrived on the former campus in Carlisle, Pa., from Wyoming to oversee the exhumation of 14-year-old Little Chief, 11-year-old Horse, and 9-year-old Little Plume—or, as the school insisted the latter be called, Hayes Vanderbilt Friday. You cannot defend the methods and sentiments behind the institutionalization of indians in America in the 19th Century but neither can you view these acts through the lens of 21st Century morality. In an age where education, communication and the science of sociology was far more primitive, inconceivably so by todays standards, the attitudes towards indians had credibility. Those days are gone, those victims' lives have ended, and the practices are long abandoned. So why does the Liberal Left continue to harp on these? IMO, they do so to gild the lily of BLM militancy and to perpetuate the great myth of 'white America' as the boogey man of humanity. Those indians visited great savagery among their tribes, practiced slavery and plundered each other and were as misogynist and racist as the worst among us today. Their xenophobic immigration policy would scarcely pass Liberal muster in 2017. Which is more important? The happiness of people (err: relatives?) that never knew these deceased . . . Or letting them R.I.P. ?